Keeping up its offensive over long power outages and water crisis in the national Capital, the Congress today held a protest in the Karol Bagh area of Central Delhi and demanded immediate intervention of the Centre to address the problems. The Lt. Governor, Najeeb Jung, today directed the Chief Secretary and senior officers of Power Department and power distribution companies (discoms) to ensure uninterrupted power within the deadline set by the Union Power Minister. Delhi Chief Secretary S.K.Srivastav inspected the Bawana-Rohini 220 KV project today along with Arun Goel, Principal Secretary (Power) and other officers. Weather continued to be pleasant in the national Capital although there was discomfort due to high humidity, and mercury rose a few notches to touch the 40 degree-mark, a day after light rains lashed the city. The Directorate of Education, Delhi government, has decided to increase the working hours of teachers by half an hour in the government schools keeping in view the Right of Children to Free and Compulsory Education Act, 2009. The safety inspection of the Central Secretariat-Mandi House line of the Delhi Metro Rail Corporation has been completed and a formal approval of the Commissioner for Metro Rail Safety (CMRS) is now needed before the commencement of services on the route. The first solar module of the Delhi Metro's Roof Top Solar Power Plant was inaugurated today at the Dwarka Sector 21 Metro station. The plant, with a capacity of 500 KWP, is expected to start generation by the end of next month. Mass marriage function organised today in Ramlila Maidan by the Udaipur-based NGO, Narayan Seva Sansthan, is one of the best examples of secularism where under one tent as many as 92 disabled and poor couples of different religions tied the knot without spending a penny. All the arrangements, including food, ornaments, clothes for bride and bridegrooms, pundits, qazis and Christian preachers, were arranged by the Sansthan in a huge tent erected in the historic Maidan. Mana Ram, a Delhi Police traffic constable, was allegedly mowed down by a car in which a driver and two juveniles were travelling last evening in west Delhi's Moti Nagar. The incident happened after a heated argument. A 30-year-old man was run over by a moving train after he fell while trying to board it at Hazrat Nizamuddin railway station here, police said today. Anup was on his way to Banda in Uttar Pradesh along with his five cousins and was to board a Sampark Kranti train. 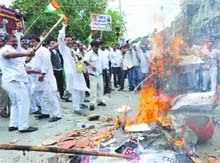 All Indian Congress Committee (AICC) general secretaries Shakeel Ahmad and Ajay Maken and Delhi unit chief Arvinder Singh Lovely led scores of party workers, who also burnt effigies of Prime Minister Narendra Modi and former Delhi Chief Minister Arvind Kejriwal, holding them responsible for the crisis. Speaking at the protest venue, Lovely said as Delhi was under the President's Rule it was the BJP-led Central government's responsibility to address the difficulties being faced by the people because of frequent outages and water crisis. "Power crisis is not a political issue for us. It is an emotional issue. When we formed the government in 1998, power crisis was our main agenda. We have with great difficulties provided power to Delhi in the past 15 years. Delhi became a power surplus state," Lovely said. "Kejriwal holds the biggest responsibility because he did not address the "summer action plan", even though we wrote him a letter in January regarding it. It does not matter to him whether the people are living with or without power," the Congress leader said. Addressing the gathering, Ahmad said, "Before the (Lok Sabha) elections, the BJP dwelled on slogans like "acche din aane wale hai". But when the people started protesting at nights (over outages), one of the BJP ministers said, we promised good days, not good nights." make him the Chief Minister again. "The AAP promised the people of Delhi that they would provide power to every house and that is why we supported it. The people have now realised Kejriwal's false promises," he said. Delhi has been facing long power outages for the past 15 days after the transmission network were severely damaged during a powerful storm on May 30. The Lt. Governor, Najeeb Jung, today directed the Chief Secretary and senior officers of Power Department and power distribution companies (discoms) to ensure uninterrupted power within the deadline set by the Union Power Minister. Delhi Chief Secretary S.K.Srivastav inspected the Bawana-Rohini 220 KV project today along with Arun Goel, Principal Secretary (Power) and other officers. He inspected the progress of the towers and directed the project engineers to work 24x7 and ensure completion of the project before the target date. "The peak demand during the day today was below 4300 MW. There was no major loadshedding today. Various task forces set up for individual projects are working round the clock. Senior officers of Delhi government are keeping a close watch and reviewing the projects regularly," said a senior official of the Power Department. "Permanent restoration of the Bamnauli-Pappan Kalan line is going on as per schedule and will be completed on June 16 while the work on the Mandola-Gopalpur line is expected to be completed today," said the official. Maharani Bagh-Ghazipur 220 KV line was inspected by Jyoti Arora, Joint Secretary, Ministry of Power. "The work is proceeding as per the timeline. The stringing work for tower no. 7 to 12 is still in progress. So far five conductors out of six were installed. Shortage of tower material is being met locally through on-site fabrication," she said. A maximum temperature of 40.6 degree Celsius and a minimum of 28 degree Celsius was recorded in the city, the Met department said. However, Palam Met department recorded a maximum of 42.2 degree Celsius, two notches above normal, while minimum settled at 29 degree Celsius, a notch above normal. According to Met department, there was no rain recorded till 5.30 pm from any part of Delhi. Humidity levels, however, soared and the city recorded between 86 per cent and 42 per cent humidity levels during the day causing some discomfort. Predicting more rain tomorrow, a Met official said the temperature would remain between 35 and 40 degree Celsius in the coming days. "There would be a partly cloudy sky with light rains and thunderstorms in different parts of national Capital tomorrow. There is possibility of partly cloudy sky with rains or thunderstorms till June 20 and maximum temperature may be between 35 and 40 degree Celsius," the official said. The decision mandates a minimum of 45 working hours per week for a teacher, an official of the Education Department said. The teachers will now get 30 extra minutes to plan their lessons, check notebooks, evaluate their own performance as well that of their students. As these activities are crucial to the process of teaching-learning, it is expected that the government schoolteachers will be able to utilize this precious time in the most fruitful way, he said. which 409 buildings have a single shift school while 298 buildings have double shift schools. As of now, these schools cater to 15.5 lakh students. The average time for a shift was 5.30 hours which includes an assembly of 25-30 minutes and a recess period of 20 minutes. So, the effective teaching time left with the school was only 4.40 hours which was divided into eight periods of about 40 minutes each. It is also known that out of 40 minutes, 5-6 minutes get wasted in the teacher leaving one class and reaching the other and then the class settling down for the next lesson. In such a short period, teachers do not get time for planning, preparing lesson, checking notebooks, meeting parents, giving extra classes and other academic works. The construction and other works under phase three on the Central Secretariat-Mandi House corridor has been completed and the CMRS conducted its inspection of the line on June 10. The approval by the CMRS is expected in a week's time. Until the clearance by the CMRS regarding the safety of travel on the route is given, the line cannot be started. "We had completed the work on the line by March this year and trial runs have been going on since January," said a DMRC spokesperson. "The CMRS has to give a formal approval, no official confirmation can be given by the DMRC as to when the Central Secretariat-Mandi House route will be opened for the public," the spokesperson said. According to sources, a day-long inspection was conducted for safety of commuter travel in trains on this section. The 3-km stretch between Central Secretariat and Mandi House is the first section under phase three of the Metro construction, for which the trial runs began in December last. The new line is expected to help decongest the busy Rajiv Chowk Metro station as commuters on the Badarpur-Central Secretariat Line who are headed to Noida and Vaishali will be able to change trains at Mandi House and not have to do so twice, as is the case now, at the Central Secretariat and Rajiv Chowk stations. The line is expected to benefit about 70,000 additional commuters traveling to parts of Connaught Place, Janpath, National School of Drama, High Court, Bengali Market and Barakhamba Road. With the beginning of power production next month, the Delhi Metro Rail Corporation (DMRC) will become the first-ever Metro system in the country to install Roof Top Solar Power Plants at its stations. "Today, the first solar module of the plant was inaugurated at site by DMRC's Director (Electrical) Anoop Kumar Gupta in the presence of officials from the DMRC and GIZ, which has actively supported the DMRC's solar initiatives," said DMRC spokesperson. The power produced from this plant will be used to cater to the power requirements of the DMRC at this station. A Power Purchase Agreement (PPA) regarding the installation of the plant was signed between the DMRC and the developer, a multinational firm engaged in the installation and production of solar power worldwide, last February. This is the largest roof top plant with such capacity in Delhi, NCR region under the RESCO model. Under this model, the DMRC will pay for the units generated by the plant and the capital investment shall be provided by the developer. The DMRC is also exploring the possibility of installing more such plants at its stations, depots, parking lots as well as residential complexes. Efforts are also being made to integrate such solar plants with the station structures of Phase III. Mass marriage function organised today in Ramlila Maidan by the Udaipur-based NGO, Narayan Seva Sansthan, is one of the best examples of secularism where under one tent as many as 92 disabled and poor couples of different religions tied the knot without spending a penny. All the arrangements, including food, ornaments, clothes for bride and bridegrooms, pundits, qazis and Christian preachers, were arranged by the Sansthan in a huge tent erected in the historic Maidan. Shabbir of village Sanbharkotha in Udaipur and Rafiqa Bano of Udaipur City said their Nikah was performed according to the Islamic religion by a Qazi arranged by the NGO. Both are handicapped and belong to poor families. Shabbir's father does not work because of poor health. The groom is the only breadwinner in the family. He runs a small betel shop in Udaipur. Rafiqa's father is not alive. Her mother conducts Anganwari classes. They came to know about the NGO through an advertisement appeared in a newspaper and got their names registered. They were given essential items, including a sewing machine and clothes, the couple said. Devi Lal and Pramila Kumari, a Christian couple of district Ratlam in Madhya Pradesh, said they were engaged by one of their preachers and their names got registered. The NGO brought a Father to solemnise their wedding. 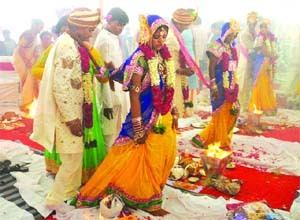 Devi Lal said, "Sansthan has done good arrangements for the mass marriage function. It has arranged wedding clothes for me and my wife. We have been given all the items to run our family. We belonged to a poor family and had no money," he said. Narayan and Bula, a Hindu couple of Rajasthan, said that they had approached the NGO for some treatment when they came to know of the marriage function. They had submitted their biodata. They met through the NGO and decided to tie the knot. The Sansthan has been conducting the mass marriage function for the disabled and poor couples for the last many years without differentiating on the basis of caste and religion. Sometimes the disabled come to the NGO for its help in the treatment of some disease when they choose their life partner and get their names registered. Those who cannot afford the marriage expenses also get their names registered with the Sansthan and on the date of the function, the couple along with their relatives reach the place to tie the knot, said Vandana Aggarwal, director, Sansthan. She said the household items distributed among the couples are contributed by the people from various cities. It organises mass marriage functions in Udaipur every year though in Delhi, it has been done for the first time. According to the police, the incident took place around 7:30 pm yesterday when the main accused identified as 26-year-old Raman Kant, who was at the wheels and accompanied by two minor friends, was stopped at the Zakhira flyover by 24-year-old constable Mana Ram. "Traffic diversions are imposed on the route from 5 pm to 9 pm, and Mana Ram had stopped the errant car. “An argument ensued between the occupants of the car and the constable following which Raman Kant reversed his car and ran over Mana Ram. He dragged him for around 150 metres," said a senior police official. Mana Ram sustained serious injuries. He was rushed to a MAS Hospital in the Punjabi Bagh area where the constable succumbed to his injuries. The trio had fled from the scene but were nabbed later. The car was also seized, the police said. A case under Section 302 of the IPC has been registered and Raman Kant has been arrested while his two minor friends have been sent to a juvenile remand home, police said. Constable Mana Ram, who has left his two-year-old son and wife, hailed from Nagaur in Rajasthan. He had joined the Delhi Police in 2010. Senior officials of the Delhi Police today paid homage to the late constable. "While four of his cousins had already entered the compartment, Anup and two others were still on the platform. "He tried to board the moving train and in the process his leg slipped off the footboard. His body slipped through the gap between the compartment and the platform and he came under the train," a police officer said. The officer also said that it was not possible to bring the train to a halt since it had already gathered pace. When the train had passed, other passengers on the platform found him lying on the platform with serious injuries.